On Counting My Spoons, I write about living life in a positive way despite chronic illnesses. The illnesses I focus on include fibromyalgia, migraine, endometriosis, and IBS. If those topics are important to you as well, then I’m interested in discussing how we can work together. If you are interested in working with me in one of the following ways (or another way I haven’t thought of) please contact me. Interviews – in addition to interviewing those with Fibromyalgia here on my blog, I am available for interviews, whether about blogging or about my health journey. Sponsored Posts – I am pretty picky about what I will share on my blog and it has to be a product or idea that I am comfortable putting my name behind (regardless of who writes the post). All sponsor posts will include a disclaimer stating that payment was received (as required by the FTC), and will include only no-follow links. Sponsored posts must be on topics related to my blog. If you are interested in purchasing a sponsored post, please feel free to contact me and I will send you my media kit and rate sheet. Product Reviews – I am excited to try new products related to health and wellness, or even read and review great books about health, psychology, or even living with Invisible Illness. If you’re interested in having me review your book or product, I’m excited to do so. Please contact me. Please note that I try to keep my blog positive, so I will only post a review of your book/product if I can find good things to say about it. Advertising – If you are interested in purchasing advertising space, you may do so here. Hire Me – I have been a freelance writer, editor, public speaker, and community manager for over 10 years. My experience has covered a variety of topics, not limited to health and wellness. Please check out my About Me page, and review my portfolio, if you would like to know more about me. Looking to work with other bloggers focused on chronic illness? 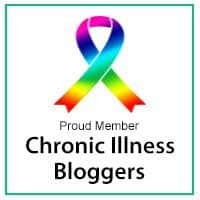 Check out The Chronic Illness Bloggers Network.